This post was originally published here on December 22, 2014. I’ve since updated the photos and text. Cheers! I consider myself to be a bourbon kind of girl. More often than not, it’s my spirit of choice. And I love it in everything from Summer sips to cozy Fall libations. But I’m also not one to discriminate. I want to be an equal opportunity maker and drinker of all kinds of cocktails. It just seems like the fair and right thing to do. I’ve noticed lately that this blog has been seriously lacking in some good gin-based beverages. So I decided to fix that pesky little problem. And my timing couldn’t be any more perfect. Because gin, with it’s strong juniper berry taste and aroma, always reminds me of the Winter Holidays. Since we’re getting REALLY close to Christmas at this point, I decided to shake up something super festive and easy. I know we’ve all got a long list of cookies to bake, decorate and eat. So I figured this wasn’t the time or place for an overly complicated cocktail with hard-to-find ingredients. Nope. This baby is real simple. And I bet you already have all of the ingredients on hand! And I even gave it a stupidly cute name: Sparkling Christmas Tree Cocktail. No actual Christmas trees were harmed in the making of this cocktail. 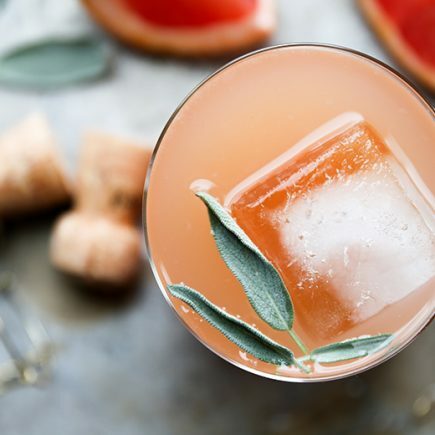 This initial inspiration for this cocktail started with a gin and tonic. I added a slash of cranberry juice for color. Then decided to swap out the tonic for club soda, so I could be more in control of the sweetness. I had a really fun time making the sparkling “branches” for garnish (and it’s kind of how the name of this cocktail evolved). And while technically they aren’t really necessary for the actual imbibing of this beverage, I also don’t think you should skip out on them either. 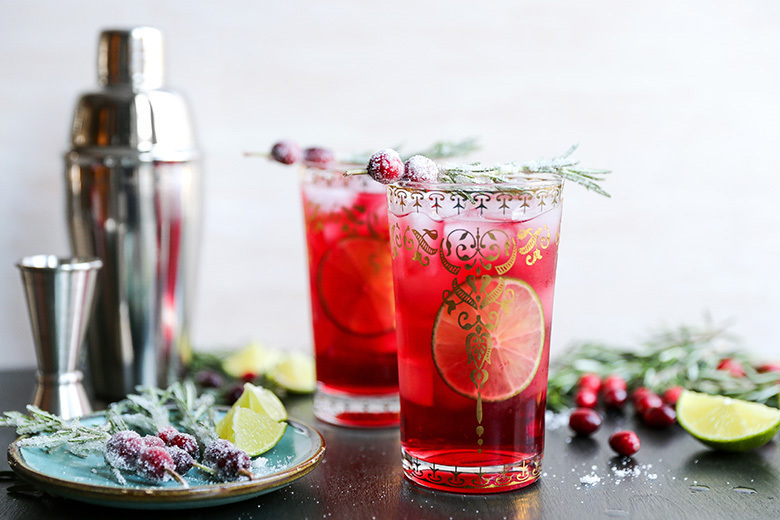 They are totally cute and make this Sparkling Christmas Tree Cocktail feel super special. So I think I’m signing off until after the Christmas Holiday. I’ll be back with a new recipe in between Christmas and New Year’s Eve. And of course, I’ll be lurking around Instagram. So come and find me there if you want! In a small saucepan over medium-high heat, combine 1/2 cup of the sugar and the water, stirring occasionally, until the sugar is completely dissolved. Remove the saucepan from the heat and let the simple syrup cool slightly. While the simple syrup is cooling, assemble the sparkling branches. Trim your rosemary sprigs so they are about 1-inch longer than the width of your cocktail glasses. Remove and discard some of the lower leaves, leaving the main stem intact. Using a toothpick, poke a small hole all the way through the cranberries. Then thread two cranberries onto each rosemary stem. You'll want to make at least one sparkling branch for each cocktail. Pour the cooled simple syrup into a shallow bowl. Place the assembled branches in the simple syrup, turning them to coat. Then working with one branch at a time, remove it from the simple syrup and gently shake off any excess liquid. Hold the branch over your sink or a bowl and sprinkle it lightly with a small amount of the remaining sugar, turning the branch as you sprinkle the sugar so it coats all sides evenly. Place the sparkling branch on plate and set aside. Continue working until all the branches have been coated. Reserve some of the simple syrup for making the cocktails. To make the cocktails, add the gin, cranberry juice, lime juice and simple syrup to a cocktail shaker filled with ice. Shake vigorously to chill. Then strain into two glasses with fresh ice. Top with club soda, stirring gently to combine. Garnish with a slice of lime and a sparkling branch. Serve immediately. These are SO FESTIVE!!!! I love them! 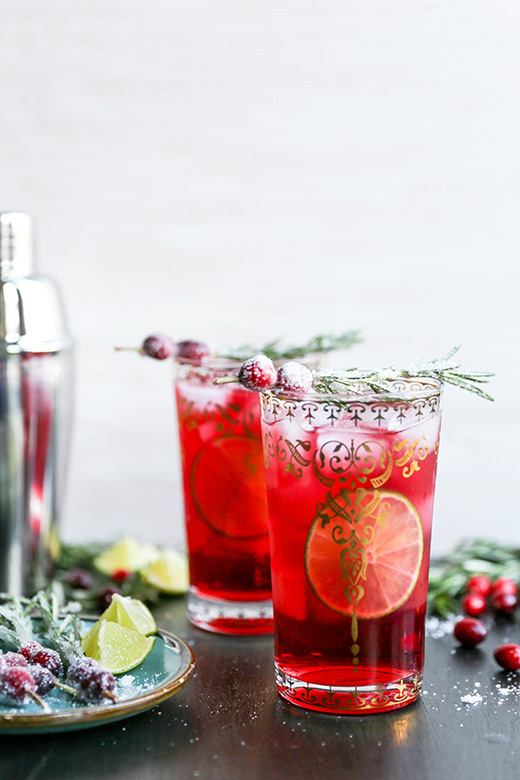 The perfect holiday cocktail. Yeah! Thanks, Laura! Hope you have a great Holiday! This drink is gorgeous, Liz! 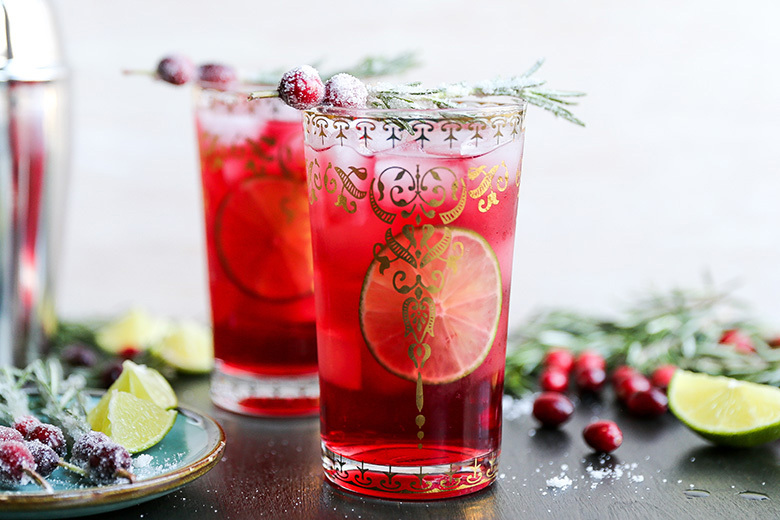 So perfect for the holidays.The branches with the cranberries are so creative! Love this! Thanks, Gayle! Merry Christmas to you! haha, Liz . . love this post!! I like how you roll . . . “covering all your bases. No stone is being left unturned. . ” 😛 love love love this cocktail!!! I have the gin and just need some cranberry juice. . can’t wait to try this!!! Happy Christmas!!! Beautiful – love that garnish! This is just pure lovliness Liz!! Happy holidays, friend! Thanks, Megan! Cheers my friend! Bahahaha no Christmas trees were harmed in the making of this cocktail! aaaah you’re too precious, I just want to squeeze the daylights out of ya! Seriously, gin totally tastes like Christmas trees, but I seem to really enjoy it! 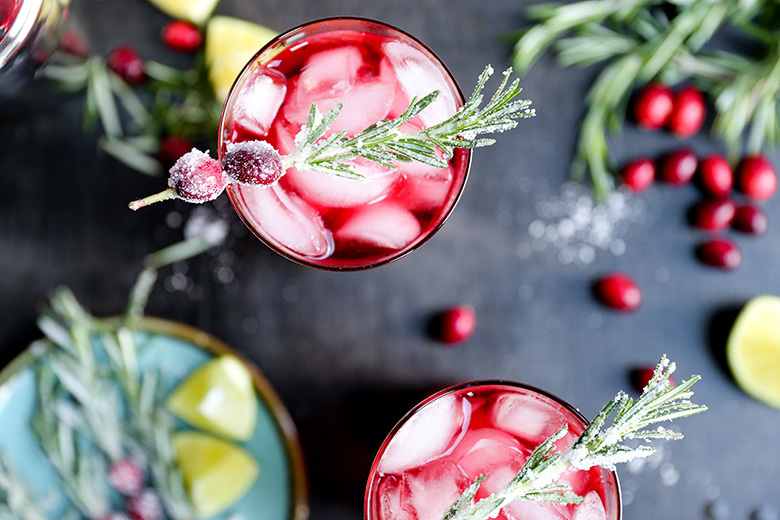 So I say this cocktail is 200% perfect for the holidays (or any ol’ time…). Pass me dat booze, sista! And keep rockin them Mondays! Oh Julia. I heart you. I’m glad we can make each other laugh. You always put a big smile on my face! I hope someday we can have a cocktail (or two) together in person! Definitely I will give it a try. Thanks ladies. LOVE this! Sugared anything is fab-tastic. You know I’m a bourbon girl, but gin definitely makes its way into my cocktail glass every so often. Pinned! Let’s plan our get together soon, yes? Yes! I will message you my cell. Easier to plan something that way! See you soon! Liz, these are absolutely stunning! While I’m a bourbon girl too, I would certainly cheat with gin for a night to have a few of these. Oh that sounds so naughty. Love it, Erin! Thank you, Marcie. I hope you have a wonderful Holiday! Hah, “no Christmas trees were harmed in the making of this cocktail”! This is such a great way to add a festive touch to the holiday dinners! Merry Christmas, friend! what a gorgeous gorgeous cocktail! Thanks you, Caralyn! It’s certainly like Christmas in a glass! These look like Christmas in a glass! So pretty!!! Definitely, Amanda! I hope you have a wonderful Holiday! This is such a beautiful cocktail I love it!! I have to give this a try! Thanks, Kelley! I’d love to hear back about how you liked it once you try it! I can be funny occasionally. Ha! Cheers, babe! Thanks, Kelsey! I know you’ll love it! Simple and SO festive Liz! Those little trees are the cutest! This sounds so perfect and cold… by a nice roaring fire, perfection! Your updates are fantastic. I’ll be working on a few in the new year as well. Hooray for time off and lurking! I’m doing the same! Thank you for this delicious cocktail! I can’t wait to give it a go! Thanks, Traci! I definitely hope you get to enjoy one of these cocktails by a fire this season. Cheers!